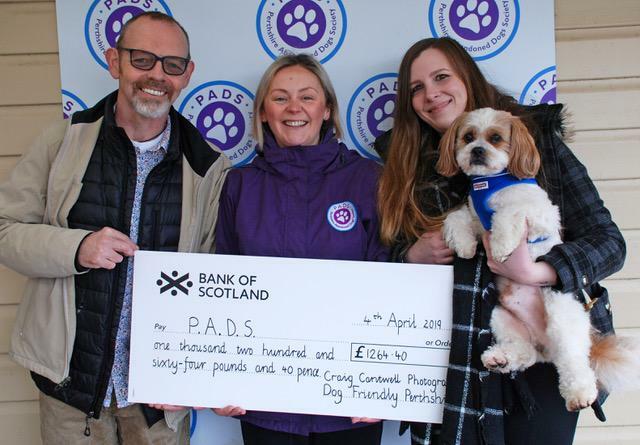 Wonderful PADS supporters Craig Cantwell Photography & Katie McCandless Thomas from Dog Friendly Perthshire raised a wonderful £1264.40! Thanks to hosts, the Green Room in Perth, Katie & Craig organised a photo shoot and the great Perthshire public were invited along with their canine pals to have professional portraits done. They also invited stall holders with doggy products who all paid fee for their ptich. Katie told us that Craig was just phenomenal with the dogs and worked all day through without a break. Katie herself was the driving force behind the event and we really couldn’t be more grateful for all the support she continues to give us. This entry was posted in Fundraising and tagged charity, Dog friendly perthshire, donation, photography.